But, I just haven't felt like cooking. 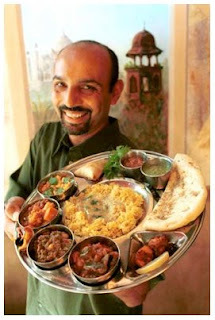 Lucky for me, there are some fantastic places to get dinner in Missoula. 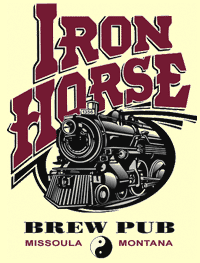 First, my absolutely favorite: the Iron Horse. Some day, I will post on all of the wonderful attributes of my favorite blackened salmon caesar salad, but for now, I will just simply mention it. There are fantastic sandwiches and desserts, and their sweet potato fries are an absolute delicious indulgence. I know MacKenzie River Pizza Company is a chain and they're about as trendy as the Iron Horse, but I can't help but really like them. They don't have that nation-wide chain feel, and they're food is always pretty good. Especially their greek salads - PHENOMENAL feta salad dressing. I really should just spend the $$$ to buy their dressing from their restaurant instead of ordering salads, but I always balk at the $5 or so containers. Another good thing to order? Pesto Fenceposts. They go great with that greek salad. Then there's Tipu's Tiger (or just "Tipu's"). Everything is fantastic if you can tolerate spicy foods. If not, I hear it's kind of a drag, but my palate likes it hot so I eat pretty much anything they serve. Also, I rarely order fried foods, but it's a habit at Tipu's. I can't turn down the samosas... and I warn you not to try to make me else the beast will emerge. This last place is quickly approaching the Iron Horse's long-standing status as my favorite. 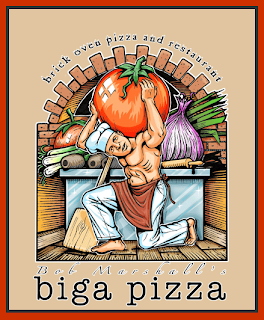 It's Biga Pizza (pronounced "bee-gah"). It's got a great atmosphere, and you can bring your own beer and wine which is a huge plus. I almost never order wine with food because it seems so expensive, yet good wine/beer is one of those things that I love to enjoy with food. So, I bring my wine with me to Biga's, and I almost always order the Vesuvio sans salami with one of their perfectly dressed caesar salads. Now that I've sat and pondered my list of favorite places to eat, I'll take a tissue and dab up my drool and go find something in the refrigerator to gnaw on.